One of the easy ways to include art appreciation into your life is to combine it with other things you’re already doing. Language arts is a perfect go-together with art, simply because art can inspire so much language! In this collection of products I hope you find enjoyable and natural ways to both nurture the love of art and the love of expressive language in your family. 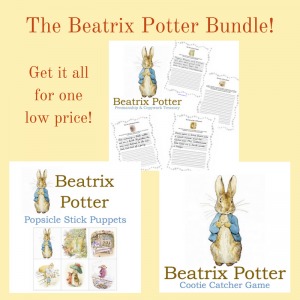 Enjoy all of our Beatrix Potter products at one low price! Regular retail when buying separately would be $20.95. The delightful tales of animal characters from Beatrix Potter’s timeless stories are not only enjoyable for children today, but are also language-rich with descriptions that inspire the imagination! This sweet collection of quotes (adorned with art!) from some of her books are meant to be used for practicing penmanship skills for print, cursive, or D’nealian manuscript styles, as well as to experience the benefits of copywork. 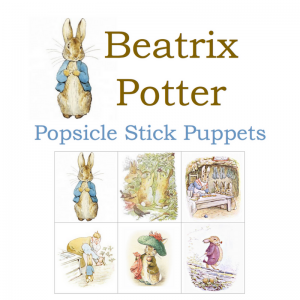 Invite your children to create and interact with the lovely and language-rich works of Beatrix Potter with this delightful collection of characters! Simply print out the character pages, cut out each image, and glue to a popsicle or craft stick. Your children can hold these puppets while you read to them, and act out the scenes, or perhaps they will be inspired to create their own sweet tales! Either way, the beauty of Beatrix Potter’s art, coupled with her sweet and engaging stories are sure to inspire your children (and you!). 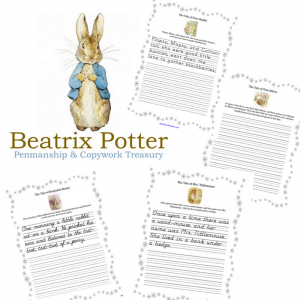 This product includes a downloadable PDF of 18 characters from Beatrix Potter stories. The stories are not included. 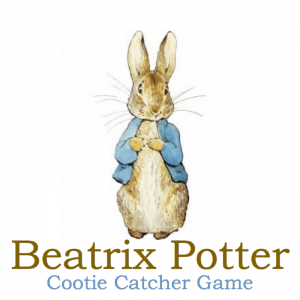 Infuse child’s play with art and language-rich literature with our fun Beatrix Potter Cootie Catcher! Simply print, cut, fold, and play. Tucked inside this cute little toy are sweet quotes from the books! Delightful as a little surprise for your children, party favors, Easter baskets, or to share with a friend! them practice cursive writing so this copywork will be great for the spring. I was so excited to see this new and exciting literature bundle!!! As a longtime homeschooling mother of six, I love it when I can find ways to connect different subjects in a way that my kids also enjoy. 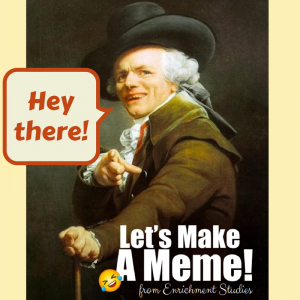 When I came across this hilarious, surprising, and fun art by Joseph Ducreux, I knew I wanted to bring it to you in a way that both showcased the timeless sense of humor that it embodies, while also inviting you and your family to interact with it, so Let’s Make a Meme! Simply print out the art, fun fonts, and accessory pages, and get to work! Let the kids cut out the letters, frames, and emojis, and have fun arranging them and gluing them into place. 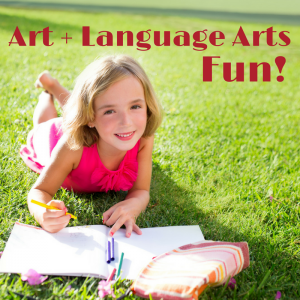 You’ve got a golden opportunity here to combine art appreciation and language arts in a way that’s current and engaging for your kids, and will have the whole family laughing and having fun! Felix Vallotton was a Swiss-French artist in the late 1800s and early 1900s. Although he was an accomplished painter, what he is best known for is his work with modern woodcut art. When I saw his series of French writer portraits done in woodcut, I knew I had found a delightful treasure that I wanted to share with you. Each face shows so much character and interest, and I could immediately see how this could be a launching point for some really fun creative writing! It took my teenagers about 3 seconds of looking at this art to start coming up with a steady stream of hilarious comments, quotes, and reactions to the French writers, so I trust your children will also find these a source of entertainment and inspiration! This is my favorite type of writing–where it’s so fun that the kids don’t even think of it as a school chore. 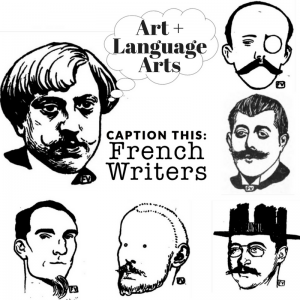 This PDF download includes 20 French writers plus several pages of speech bubbles, thought bubbles, text and tweet graphics, caption frames, and more! This fun and easy Art+Language Arts activity will have your kids cracking up.